Our speaker was Dr Andrew Levan from Warwick University who had come to talk to us about "The Biggest Bangs: Supernovae and Gamma Ray Bursts". He began by explaining that supernovae are stars that have so much mass that when they come to the end of their lives they explode and the light from the explosion can be seen from far across the Universe. The light from these explosions can last from about a week to a couple of months. On average, Dr Levan told us that there are five supernovae explosions every second in the whole Universe but only one a century in our own galaxy and they usually occur in stars that are one hundred times the diameter of our Sun. These massive stars are so hot that the nuclear reactions at their core happen so fast that they will only remain stable for around a million years compared with the 10 billion years our own Sun is expected to continue shining. He explained that when nuclear reactions begin in the massive stars they begin by changing hydrogen into helium in a process known as fusion. When most of the hydrogen is used up it then starts to fuse helium into carbon. This process continues as heavier and heavier elements are produced from lighter ones until the element of iron is reached. Until this point the fusion process generated energy that kept the star inflated and stable but the production of iron is the end of road. At this point there is nothing to keep the outside of the star in its enlarged state and so the star implodes before rebounding off its central core and exploding — a supernova is born. 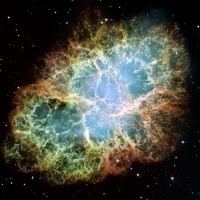 In contrast to the length of time that a supernova explosion may be detectable, the radiation emitted by a gamma ray burst only lasts from thousandths of a second to several hours. Gamma rays have even more energy than the X-rays that are more well known in everyday life should you have the misfortune to break a bone and have an X-ray taken in hospital. So, it is little surprise that gamma ray bursts are the brightest events in the Universe even though they occur at vast distances from Earth. The initial burst of gamma rays is followed by radiation of longer wavelengths including visible light waves. He then said that gamma ray bursts were only recorded relatively recently in the 1960s when the Vela satellites were launched into Earth orbit to check that the Soviet Union was complying with the 1963 Partial Test Ban Treaty. On July 2nd 1967 a burst of gamma rays was detected that did not match the signature of any known nuclear explosion. Further detections from different orbiting Vela satellites allowed the scientists to calculate the location of the bursts and conclude that they were far distant in origin. Gamma ray bursts are split into two types: those that last less than two seconds and those that are longer than two seconds. The shorter bursts are thought to be the result of very massive stars exploding as a supernova whereas longer bursts are thought to be due to the merging of two neutron stars or a neutron star and a black hole. The end result of both long and short gamma ray bursts is the same — a black hole.